Two men are facing burglary charges after Chicago police chased them from Avondale into Lincoln Park last Wednesday, eventually capturing the duo near Diversey and Paulina. Luther Fowler, 44, and Nicholas Sessum, 26, are both charged with two counts of residential burglary, according to court records. 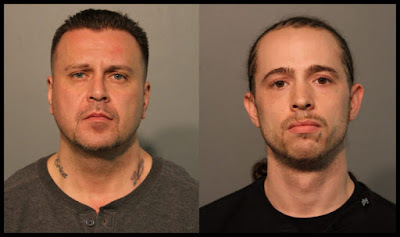 Their alleged break-in of a residence in the 2800 block of N. Rockwell is outside of our normal coverage area, but we found their story noteworthy for a couple of reasons. First, Sessum's arrest came on the day after his parole for a theft conviction ended, according to state records. And, then, there's volume of property that officers say they found in a pillowcase that Fowler was carrying: 6 wallets; 7 rosaries; 5 boxes of miscellaneous jewelry; 6 pieces of loose jewelry or gems; 19 watches; and a Galaxy Note II. Curiously, while police say Fowler had 6 wallets in his possession, he did not have his own wallet. Police found that on the roof of a home near the scene of his arrest. A police report says Fowler is a member of the Latin King street gang. State records show that Sessum has multiple Latin King-affiliated tattoos. Bond for Fowler is set at $150,000. Sessum's bond information was not immediately available.